Fluids are vital to your vehicle’s overall health and performance. Fluids impact almost every facet of your car, like fuel economy and longevity. Proper levels will allow your car to succeed longer and drive better. Windshield washer — yes, even this is important; you never know when you will suddenly need it for visibility! See a few there that you hadn’t thought of? All six make a difference in your driving experience and safety. What belts and hoses do you need to be concerned about in your car? Well, two big belts are the timing belt and the serpentine belt. The timing belt is what makes the crankshaft turn the camshaft. The opening and closing of the camshaft valves are essential for the health of your engine and the performance of the pistons. Timing belt breaks cause major engine damage. These breaks can be prevented by regular MPI’s. Loose or has slipped belt valves can open at the wrong time and be hit by your engine’s pistons. If you hear a slapping noise coming from your engine, you probably have a slipped belt–don’t delay vehicle service! Typically, timing belts should be replaced every 60,000 to 86,000 kilometers (or 50,000 to 60,000 thousand miles). The serpentine (drive) belts are what power your air conditioning compressor along with your steering pump, cooling fan, air injection pump and more. Breaks to the serpentine belt can lead to engine overheating and permanent engine damage. Cracks, wear, and stripping of the serpentine belt are indicators to our technicians that it is in danger of failing. The serpentine belt should be inspected every time you have your oil changed. How do you know if you have an issue? Listen for irregular engine noises like screeching during start-ups on cold mornings or when you execute a sharp turn. Serpentine belts most often fail between 57,000 and 87,000 kilometers (or 36,000 to 50,000 miles). Tiny cracks can form from the inside that can eventually lead to a burst hose and overheated engine. Have your vehicle hoses and accompanying clamps inspected twice a year. These do wear out, and you want to be ahead of the game rather than have something break or leak while you’re trying to go about your busy day. As you well know, a good set of tires can be your best friend and a set that are in poor shape can land you in a heap of trouble. We’ll make sure you’re all set. We will conduct tests that examine tire pressure, tread depth, and tire health (damage). We will also assess how your front and rear brake pads are holding up as well as rotors, hoses, and calipers. All these elements that support your vehicle’s ride are vital to the safety of all. These also fall into that category of things you don’t necessarily see every day, but you’d sure notice if they weren’t in good condition. Again, our aim is to identify potential problems and counter them early and effectively. You want transportation you can rely on. This reliability is contingent on key elements working without a hitch. Transportation components that we inspect include: transmission and drivetrain, steering, and brakes. Scott’s Auto technicians will also see if there are any leaks stemming from the transmission, differential, transfer case or engine. We don’t forget to check the health of your vehicle’s wiper blades, exterior lights and signals, horn, emergency brake, and cabin air filters. So many things in your car contribute to your driver experience and your car’s reliability on the road. Customers visit Scott’s for a multi-point inspection because they want the peace of mind that their car is safe and maintained to offer years of reliability. 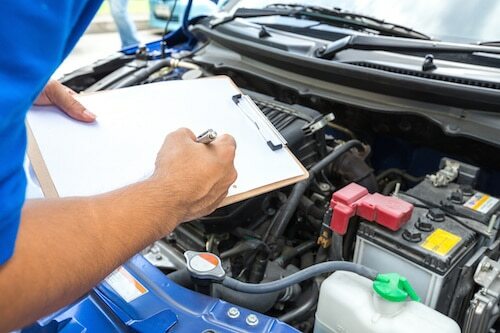 Knowing what your car is in need of–what is starting to show wear–increases your knowledge and gives you a point of reference for servicing. Buying a used vehicle? Don’t skip the multi-point inspection! Scott’s Auto trained technicians can flag issues that may end up costing you more money in the long run that you need to watch out for. Multi-point inspections aren’t just optional, but in some cases required! Need a safety and emissions test for state licensure? This is part of a multi-point inspection. If you think your vehicle could benefit from a multi-point inspection, call 970-682-4202 to schedule one today. Our Scott’s Auto technicians will use a detailed checklist to make sure that your vehicle is functioning the best it can. We will provide you with the MPI form that illustrates the condition of each component we inspected for your records.